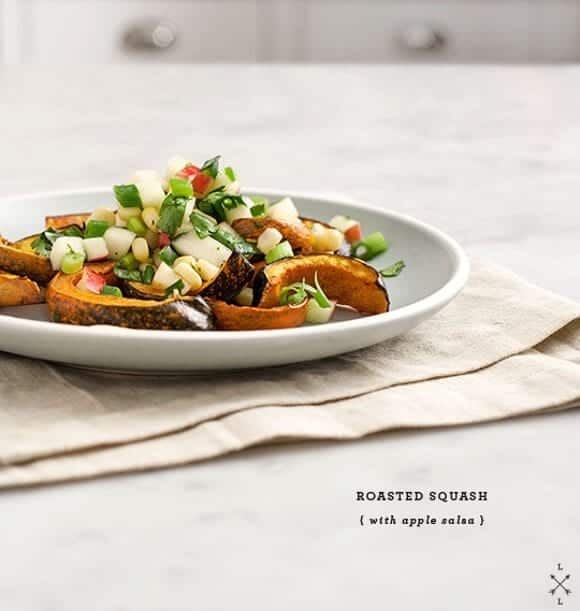 Sweet winter squash are topped with a crisp and tangy fall apple-jalapeño-lime salsa. 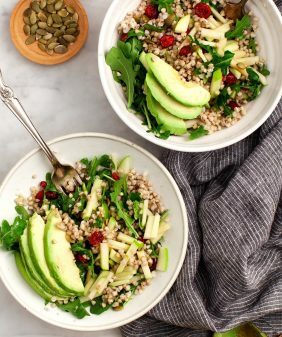 Serve for a unique Thanksgiving side or a healthy vegan and GF main! We ate it spooned over roasted acorn squash slices and grilled salmon. I just love how I would have never thought to put this combo together, but I’ll totally be making it again and again. 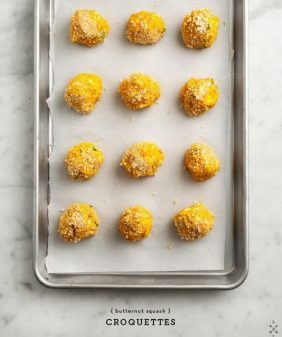 Toss the squash slices with the olive oil, honey, salt and pepper. Roast in a 400 degree oven for 30-40 minutes, until slices are golden brown and the skin has become tender. Meanwhile, make the salsa: In a medium bowl, mix the apple, scallions, corn, jalapeño, lime juice, cilantro, a drizzle of honey, and pinches of salt and pepper. Taste and adjust seasonings and refrigerate for 30 minutes for the flavors to develop. Serve over the roasted squash slices. Does frozen corn work alright without being grilled? I kinda just assumed it would be a little rubbery. 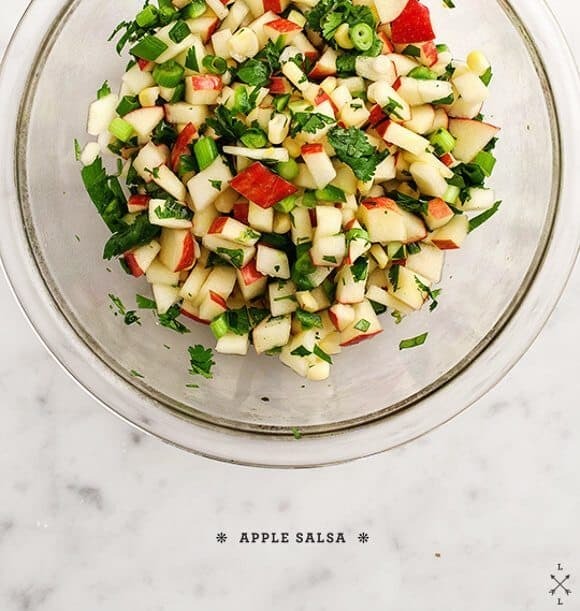 Beautiful salad – you’re right, never would have thought apples with cilantro and lime but I trust you. Do you eat the skin of acorn squashes? I know New Zealand pumpkins (squashes) we always eat the skin but I don’t know about ones over here. The most nutritious part they say! oh and yes, I ate the skins… I think it probably depends on the kind of squash you have, but I find the skins on acorn squashes and delicata squashes become tender enough after roasting them. Yep, it was good I just mixed it in frozen and it didn’t become rubbery. There’s not all that much of it in here so it kind of just works as a texture in the background. Although I’m sure grilled fresh corn would be delicious here if you had that available to you. I am digging this Fall-sa! Looks fantastic. I love how your mom showed up asking to eat what you normally make for the blog, that is so sweet! This sounds so great! I think I’m going to insist this be a Thanksgiving appetizer or side dish. My family has a propensity for starches and over cooked veggies as Thanksgiving side dishes, and they all start to taste the same. This would be a welcomed change of pace, as far as I’m concerned. I had the same question about the skins, so thank you Christina, for asking. I have not eaten a lot of acorn squash and would have never considered eating it, but now that I think about it, I bet it is delicious roasted. 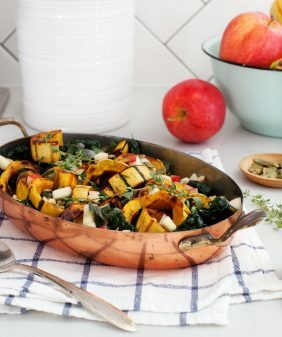 Thank you so much for this recipe – it’s such a great tribute to autumn fruits and vegetables! Ooohh! 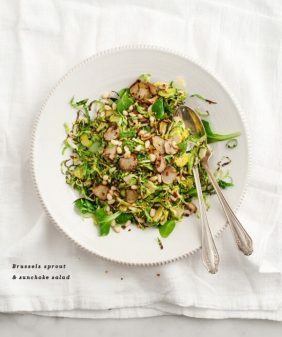 I love winter salads that combine warm winter foods with some fresh, crunchy, cold fruits or veggies. This combo sounds perfect. Fall-sa. Brilliant. Love the sound of this dish! I love little throw together kind of foods like this in general. Roasting a veggie and putting something tasty on top is a way of life around here. Such a perfect way to break out of the same ingredient rut too. The salsa looks so good. Usually I associate salsa with liquidy and heavy, but I like the idea of something so light and fresh. Such an intriguing and delicious combination of flavours. Love how this really celebrates fall’s bounty. Love this combination and “fall-sa”, ha! Wow this sounds delicious! I would have never thought to make salsa with apples – and I love me a good fruit salsa. I’d love to try it with salmon like you suggested or maybe even with leftover Thanksgiving turkey. Fall-sa! That is just brilliant. 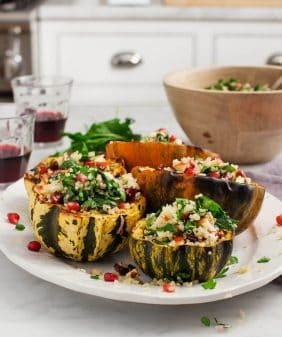 I didn’t know that I could love acorn squash with skins on, but these were so tender and flavorful roasted with just a bit of olive oil and honey. The cold salsa added such a nice contrast of texture and tartness and was delicious with both the squash and grilled salmon. 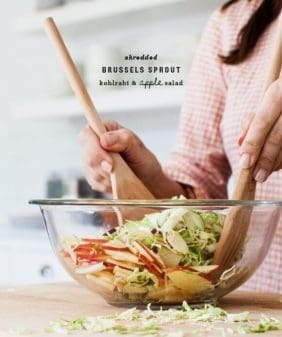 I can’t wait to make this at home! Ha! Fall-sa. I don’t know why I didn’t think to make apple salsa before, this is just brilliant.